Hope your Fourth of July weekend was great fun. Although I must say "Boy, could the rain have waited until the work week!" Oh, well, my lawn and plants and everyone else are sure looking good after the rains. I am just happy we are here and not up the east coast and in the 100s in NYC. That concrete must be HOT!!! Sometimes 88 degrees can seem cool. We are still accepting the THREE WORDS that mean Quilting to you. Lots of good ones are coming in and do stop by and read the windows. We will be accepting entries until Saturday, July 17th and will announce the winners at our Half Birthday Party on Saturday, July 24th. RJR Fabrics couldn't be out done, so wait until you see "Fancy Hill Farm" from Robin Pandolph. 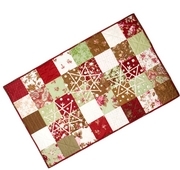 It is in such beautiful shades of red and green but not such a holiday look that it could work all year. This is definitely a more sophisticated, shabby chic look. The fabric feels great. 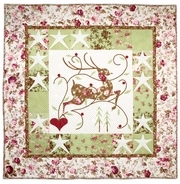 A Winter's Dream is located on as a free pattern on RJR's website. 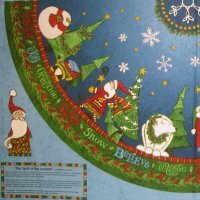 But then we took a look at Wilmington prints and fell in love with a modern yet old-fashion Santa based Christmas line called "Spirit of the Season." 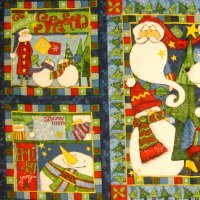 They have done a tree skirt that is large enough for a big tree of two panels for just $21.70 and a cute coordinated panel great for pillows, placemats or table toppers. Did I mention we got in some new batiks????? Now you have heard about all the new fabrics that are arriving, well do you think the designers of patterns and books are sitting around idle. No!! Double No!! Here is sampling of some of the new patterns and books. 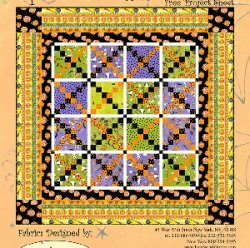 The new quilting books by Patsy Thompson, one being "Hyperquilting!" that are to die for. Margy and I have already gotten ours. Kelly Mueller of The Wooden Bear has the neatest book with a collection of simple projects to help make Halloween a little more haunting and a little less daunting. It is called "Happy Haunters." 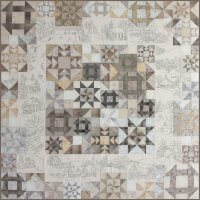 There are also new books from Blackbird Designs called "Country Inn", Jo Morton and her wonderful quilts, and so on and so on. The patterns are better than ever. There are a lot of new patterns for children's clothing. The simplest dresses from 2T through size 12; even diaper covers. What do you think of that? We are still holding our judgment out on that. There is a complete listing on the web at our website www.jampatch.com and will no longer be sent in the email. It apparently is too large a file to send this way. Just wanted to let you know that Margy has completed the top from the Blackbird Design's called "Halloween 1904" and is hanging in the new classroom. This is being offered in a class on Wednesday, August 11Th and Wednesday, August 25th from 10am - 2pm from Margy and will cost $30.00 for the two sessions. Here are some pictures. We do have kits. A few Christmas projects have been added to the schedule as well. Jeri is hosting the ever requested "Trees Up" and "Presents Wrapped". Jackie has "Vanilla Latte" done in a holiday layer cake. Okay it is time to celebrate our Half Birthday.....Starting on Friday, July 16th through Saturday, July 24th, we will be having a blast here at the Patch. We will open at 9am on Friday, July 16th and I would recommend that you be here. We have some terrific plans for presentation on Thursday, July 22nd, Friday, July 23rd and Saturday, July 24th. All presentations will be at 10:30am each day. More information will be on the web and will be sent to you next week. We will Flamingo Run without the "run. ", There will be door prizes, gifts, etc. We are closing out the Michael Miller Fairy Frost line. The bolts are in the sample room and will be 40% off each cut over 1 yard. Also on sale this week- all Westminster/ Free Spirit fabrics. Yes, that includes the Amy Butler, Kaffe Fassett, Jane Sassman, Heather Bailey and MORE. 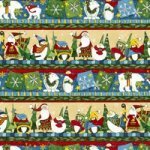 These fabrics are 25% off a yard, 1 yard cut minimum with no Clubhouse points awarded or Clubhouse Gift Certificates redeemable. Don't miss this sale through Thursday, July 15th. All sales are final. Hope to see you soon. We have a quilt luminary here this weekend thanks to the Martin County Quilt Guild, Laura Wasilowski. Margy and I will be taking three days with her and we are so excited. I am sure we will be chatting about it next week. Let's GLUE! !